Attack 1 : DON'T VOTE IF YOU LIKE HIM! Attack 2 : VOTE 5 STARS IF YOU HATE HIM! 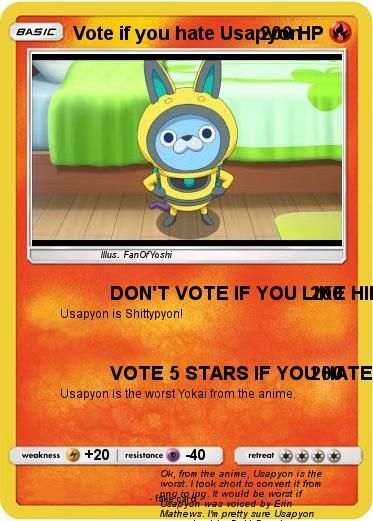 Usapyon is the worst Yokai from the anime. Comments : Ok, from the anime, Usapyon is the worst. I took short to convert it from png to jpg. It would be worst if Usapyon was voiced by Erin Mathews. I'm pretty sure Usapyon was voiced by Debi Derryberry.